The way America flexes it economic muscle around the world is changing dramatically—and not necessarily for the better. In 1997, facing a wave of sovereign debt defaults, the International Monetary Fund asked its member states to pledge lines of credit to support Fund rescue efforts. The United States and other nations did as asked. In 2009, the United States responded again to a call for expanded credit lines. When the Fund sought yet another expansion of these credit lines last April, 39 countries, including China, Russia, Brazil, Mexico, India, and Saudi Arabia, stepped up. Even cash-strapped Italy and Spain pledged support. But the United States was conspicuously absent. A pledge from the United States requires congressional authorization. In the midst of last spring's contentious debate over U.S. government deficits and debts, support for an international body was a political nonstarter. Where the United States had previously demonstrated international leadership, other countries—some of them America's rivals for international influence—now make the running. This is a small example of what may be a troubling trend: America's fiscal predicament and the seeming inability of its political system to resolve these matters may be taking a toll on the instruments of U.S. “soft power” and on the country's ability to shape international developments in ways that serve American interests. The most potent instrument of U.S. soft power is probably the simple size of the U.S. economy. As the biggest economy in the world, America has a lot to say about how the world works. But the economics profession is beginning to understand that high levels of public debt can slow economic growth, especially when gross general government debt rises above 85 or 90 percent of GDP. The United States crossed that threshold in 2009, and the negative effects are probably mostly out in the future. These will come at a bad time. The U.S. share of global economic output has been falling since 1999—by nearly 5 percentage points as of 2011. As America's GDP share declined, so did its share of world trade, which may reduce U.S. influence in setting the rules for international trade. And it's not just the debt itself that may be slowing GDP growth. 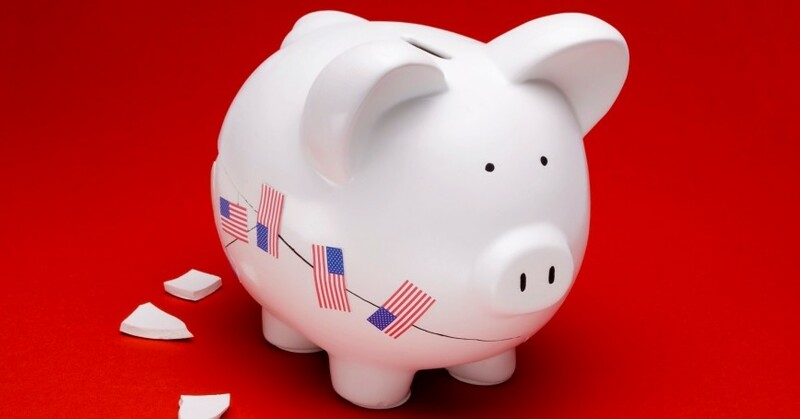 Economists at Stanford and the University of Chicago have demonstrated that uncertainty about economic policy—on the rise as a result of political squabbling over U.S. fiscal policy—typically foreshadows slower economic growth. Investors may be growing skittish about U.S. government debt levels and the disordered state of U.S. fiscal policymaking. More troubling for the future is that private domestic investment—the fuel for future economic growth—shows a strong negative correlation with government debt levels over several business cycles dating back to the late 1950s. Continuing high debt does not bode well in this regard. But perhaps the worst consequences of U.S. debt are actions not taken. U.S. international leadership has been based, in part, on contributions—political and financial—to major institutions and initiatives—International Monetary Fund, World Bank, General Agreements on Tariffs and Trade (and later World Trade Organization), NATO, North America Free Trade Agreement, the Marshall Plan, and so on. These served U.S. interests and made the world better. But what have we done lately? The Doha round of trade negotiations has stalled. Ditto efforts at coordinated international action on climate change. Countries of the Arab Spring need rebuilding. Little progress is apparent on the Transpacific Partnership, a proposed new free-trade area. And warnings from the U.S. treasury secretary to his European counterparts about the dangers of failing to resolve the fiscal crisis in the eurozone met with public rebukes: Get your own house in order before you lecture us. Have U.S. fiscal problems undermined America's self confidence and external credibility to the extent that it can no longer lead? And what about unmet needs at home—healthcare costs, a foundering public education system, deteriorating infrastructure, and increasing inequality? A strained fiscal situation that limits resources for action and absorbs so much political energy cannot be helping with any of these matters. But without progress on such things, what becomes of the social cohesion necessary for unified action abroad or the moral authority to lead other nations by example? America's fiscal predicament is serious. The problem has become obvious in the last few years, but it has been building for decades, largely the result of promises of extensive social benefits without a corresponding willingness to pay for them. Putting U.S. government financing on a sustainable path will require painful adjustments over a number of years—increased government revenue and painful reductions in government outlays, almost certainly including outlays for defense and international affairs. During the necessary period of fiscal adjustment and constrained government resources, U.S. international influence may decline yet further. But there is no alternative to getting on with the task. The world has not yet found an acceptable substitute for U.S. leadership. C. Richard Neu is a senior economist at the nonprofit, nonpartisan RAND Corporation. This commentary originally appeared on U.S. News & World Report on January 31, 2013. Commentary gives RAND researchers a platform to convey insights based on their professional expertise and often on their peer-reviewed research and analysis. Previous Blog PostLegalization and Border Security: Are We There Yet?Next Blog PostThe European Cyber Security Strategy: Too Big to Fail?